With a full range of NTSC to PAL (and vise versa), you can convert old NTSC large screens into televisions. 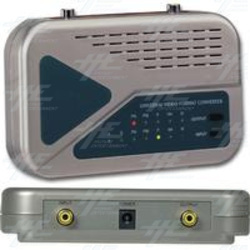 Plug in your video player/DVD player/amplifer into the convertor and begin watching movies. Also in stock we have video (NTSC/PAL) to RGB, video to PC computer, with a wide range of features. To view more details and product information, please go to the PARTS section.